I first fell in love with the wild and wooly Outer Hebrides of Scotland in Peter May’s Lewis Trilogy, three outstanding novels that captured the beauty of that isolated wildness. I also have the companion book by May and photographer David Wilson that is a testament to just how on target the written descriptions from the Lewis Trilogy are. 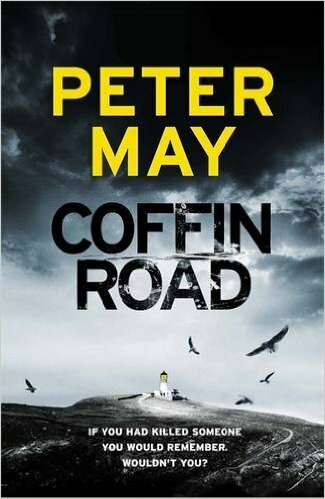 Now, Peter May returns to the setting of the Hebridean archipelago in his latest book, a standalone, Coffin Road. This time, it is the Isle of Harris that is the featured spot in the Outer Hebrides, and it is once again a tale of depth as only Peter May can pull from these islands. Three stories that need to be resolved. Three stories that are dependent upon one another to fill in the blanks. And, the book begins with just that. A blank. A man is washed up on the beach at a sparsely populated area of the Isle of Harris and doesn’t remember who he is or why he’s there. All he knows is that something bad has happened and he might be involved. He’s wearing a life jacket, but there’s no boat or other means of explaining his arrival. Struggling up the beach, he encounters an elderly woman who just happens to be his neighbor and calls him Mr. Maclean. The woman realizes Maclean is not well and leads him to his cottage. He is able to add the first name of Neal and a profession of writer after other neighbors, apparently friends, drop by. Neal makes a decision not to reveal his amnesia due to his uneasy feeling on the beach, and thus begins a frustrated effort to regain his identity and memory. A map with Coffin Road designated on it surfaces, but with no memory of it or its significance. He was supposedly writing a book about Eilean Mor and the mysterious disappearance of three lighthouse keepers on that island in 1900, but he can’t find a manuscript or any related work. Another man lies dead from a head bashing in a small chapel at a lighthouse on Eilean Mor. Detective Sergeant George Gunn is sent from Stornoway on Isle of Lewis to investigate who the dead man is and what he was doing on the uninhabited island and who would want him dead. No small task with no ID on the murder victim. His only lead is the identification of a man seen fleeing the island by a tourist boat captain. With the action going on in the Outer Hebrides, there is a third mystery forming in Edinburg, where a teenage girl is making discoveries that turn her world upside down. It’s been two years since her father’s disappearance was ruled a suicide, and Karen’s mother has just moved her boyfriend into the house with them. Karen’s transformation from a young teen at the time of her father’s death to a bitter, rebellious young woman with multiple tattoos and body piercings two years later has brought her to the point of breaking with her mother. Desperate for an anchor, Karen Fleming turns to her godfather, who worked with her father, for information about her father, something to help her find closure. She finds anything but closure, and lives are in danger as a result. Peter May is a genius at many things in his writing, but two of the most brilliant are the aforementioned setting descriptions and the skill that must bring these layers of story together to fit seamlessly into a complete picture of who, what, when, where, how, and why. Is the murder of a lone man at an isolated lighthouse connected to a girl’s quest to find answers about her father? Is a man’s loss of identity authentic or a convenience? There are secrets hiding in every crook and cranny of this book, and May orchestrates their revelations into a perfect flow of need to know. Peter May also is adept at turning out interesting characters, and his movement of them reminds me of chess pieces that are strategically and expertly placed. The main character of the novel is that of the amnesia sufferer, Neal Maclean, so readers must deal with an unreliable narrator much of the time, but one on a fascinating path. There are alternating narrators, with George Gunn and Karen Fleming taking their minor turns, but it is through Neal that readers must try to make sense of most of the twists and turns. Being a fan of the unreliable narrator when done well, I think May pulls it off quite well with the amnesia being the vehicle of unreliability. With every move towards regaining identity and memory, Neal Maclean edges towards reliability, and the story moves towards resolution. And, with all the substance Coffin Road has with the characters and the setting and the layers of story, there is a cause. The reason for the secrets and the isolation and murder, a world issue that is woven into the story elements that will leave the reader with lingering fears of an all too real terror. I am pleased to say that with Coffin Road, readers will be treated to one of Peter May’s best and most thrilling tales yet.